I can't believe I delivered my precious baby boy one year ago. 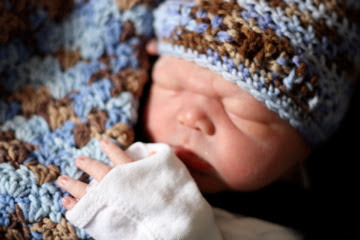 I have wanted to share my birth story for awhile now, but time has just flown by. 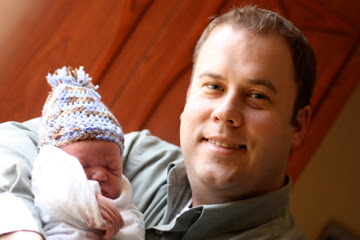 On March 12, 2010 around 6am I started to feel some pretty good contractions. I decided to get in the bath and try to relax. I had an appt with Dr Goff at 9am that day, so I decided to wait and see if my contractions were going to get harder and closer together. When I got out of the bath about 8am I had a little bit of bloody show so I knew this was probably it. I went to my appt at 9am and my contractions were getting stronger and closer by that time. When I got into see Dr. Goff, I was dilated between a 5-6 and +1 station. He told me to head on over the the hospital. I was starving at this point and I begged him to let me grab something to eat before I went up the the hospital. I reminded him that I wanted a "drug free" delivery and it shouldn't be a problem if I ate a little something. He laughed and said I could. I will never forget being in the cafeteria by myself breathing through contractions and eating a bagel. My hubby was on his way up to the hospital and had know idea I was eating by myself. I had many sweet people ask if they could help me up the to maternity floor. It was pretty funny! Once I got up there, they checked me in and I was so comforted to know that my sweet friend's mom was there to help check me in and be with me. When it was time for my IV, I told them I just wanted an IV hep lock, so they would have IV access if they needed it. I didn't have any fluids or meds through my IV. It was so nice to get up and walk and not have to worry about that darn IV pole. They also put me on the monitor to check and see how Sam was doing. They only had to put me on it twice. I was nice not to be attached 24/7. Once they did my blood work and checked me in, I was free to walk the halls. When the nurse checked me, I was a seven. By this time my hubby had arrived to help calm me and rub my back. This was about 10:45 am. I walked the halls for about 45 minutes, then I decided to get into the shower. The shower was the BEST! It felt so good! I would come out of the shower and sit and take a break, then I would get right back in and breath through my contractions. At about 12:15 pm I felt a lot of pressure. I had Jeff call the nurse and when she checked me, I was complete. I started pushing and my water broke. I pushed about four or five times and then my precious Samuel Charles Melton was born at 12:26 pm. Dr. Goff made it just in time! He even let Jeff deliver Sam! It was amazing! I'm not going to lie, it hurt REALLY bad! Jeff said I didn't scream or act crazy! The nurse said I was quoting scripture. " I can do all things through Christ who strengthens me". I didn't know I was saying that. Pretty cool! Right after he was born, they placed him on my chest for about an hour. When they took him to the warmer, I jumped right up and watched. It was great! No sea legs! He was a healthy 8lb's 1oz baby boy. If your wondering why on earth I would choose to have a drug free delivery, let me tell you why. First of all, I have nothing against epidural births. I had epidurals with both of my girls. They were both pretty smooth deliveries. To be honest with you, I just wanted to have Sam the way God intended. I know that might sound crazy, but it's the truth. I wanted his birth to be simple and natural. I couldn't have done it without support. My hubby was a wonderful coach! I'm so thankful that he was on board with everything. My best friend has had two drug free deliveries and she talked me through everything during my pregnancy. I don't know what I would have done without them! I had wonderful support from my family, but some of them thought I was a little nuts! That's alright! I still love you! If you were to ask me if I would do it again, without hesitation, my answer would be yes! 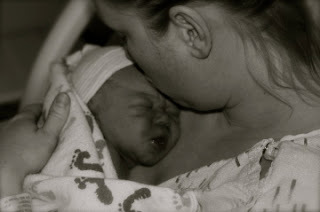 It was an awesome experience and I'm so thankful we made the decision to have a natural and peaceful delivery. Beautiful birth story! There were quite a few things that I didn't even know about, like you eating breakfast by yourself in the cafeteria! lol You're a nut. Wish I could have been there. You did an amazing job!! Love you!